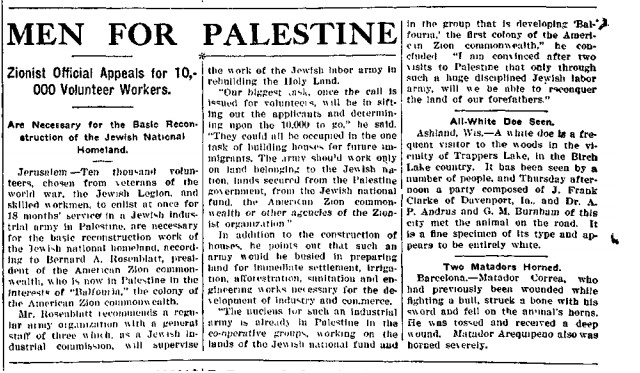 One of the more interesting articles from 90 years ago is this one, detailing plans involving 10,000 volunteers to spend time in Palestine (then ruled by the British) to build Balfouria, the “colony of the America Zion commonwealth”. Zionist Official Appeals for 10,000 Volunteer Workers. Are Necessary for the Basic Reconstruction of the Jewish National Homeland. 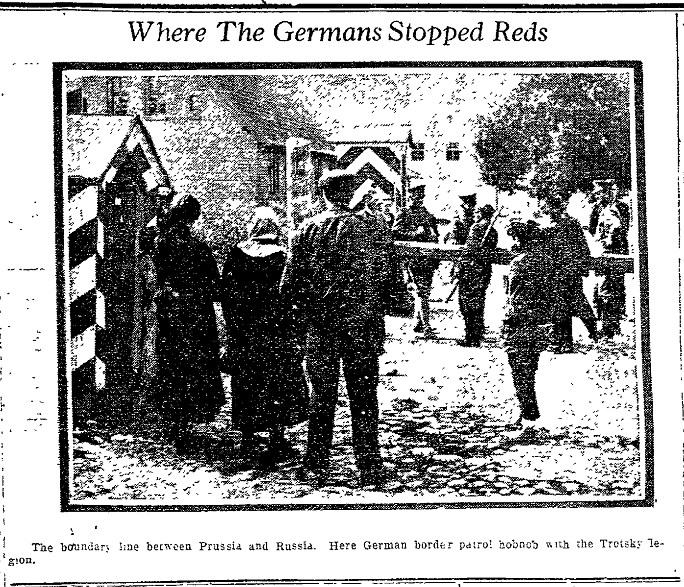 Jerusalem — Ten thousand volunteers, chosen from veterans of the world war, the Jewish Legion, and skiled workmen, to enlist at once for 18 months’ service in a Jewish Industrial army in Palestine, are necessary for the basic reconstruction work of the Jewish national homeland, according to Bernard A. Rosenblatt, president of the American Zion commonwealth, who is now in Palestine in the interests of “Balfouria,” the colony of the American Zion commonwealth. Mr. Rosenblatt recommends a regular army organization with a general staff of three which, as a Jewish industrial commission, will supervise the work of the Jewish labor army in rebuilding the Holy Land. In addition to the construction of homes, he points out that such an army would be busied in preparing land for immediate settlement, irrigation, afforestation, sanitation and engineering works necessary for the development of industry and commerce. The next two are just curiosities – the first one is an image with a caption and the second isn’t interesting enough to type out, but is worth looking at to keep in mind that gossipy and slightly trashy fare isn’t anything new in a newspaper.